The Germany-North Tour by ombiasy WineTours, organized and led by Annette Schiller, took place from September 6 – 12, 2015. The group was small - there were 7 of us, including Annette and Christian Schiller. The tour took us to the Rheingau, Mittelrhein, Ahr, Mosel and Nahe. In the Rheingau, we visited 5 producers: Baron Knyphausen, Barth, Spreitzer, Bardong and Schloss Johannisberg. This posting covers the visit of Wein- and Sektgut Barth. We also had lunch at Wein- and Sektgut Barth. Mark P. Barth was our host. Wein- und Sektgut Barth is located in Hattenheim in the Rheingau. It overlooks the Rhein River and was founded in 1948 by Johann Barth. Originally a mixed agricultural facility, the property was transformed by Norbert Barth, the son of Johann Barth, in 1973 to a fully operational winery. In 2010, Norbert’s daughter Christine Barth and her husband Mark P. Barth took over; although both are trained winemakers, Mark takes the lead in the vineyard and the cellar today. Since being in charge, Mark and Christine have re-built a state of the art cellar, tasting room (where we had our tasting luncheon) and modernized facility that is über contemporary. They have nearly doubled their production and today own 18 hectares. Production is about 135000 bottles per year. Mark Barth was recently recognized by Handelsblatt (the Financial Times of Germany) among the best young winemakers in Germany. It is remarkable: For its entire length of nearly 560 miles, the Rhine flows north with one exception – a 28-mile stretch where the river changes its course. Here, it flows to the west, thereby enabling both the river and the vineyards facing it to bask in the warmth of the sun all day long. This is the Rheingau, one of the medium-size German wine regions. Hattenheim lies about in the middle of the Rheingau wine region, close to the famous Eberbach Abbey. Eberbach Abbey dates back to the 12th century, was erected by monks of the Zisterzienser order from Clairvaux in Burgundy and is known for its Steinberger Vineyard. Besides excellent (still) wines, from early on Barth produced sparkling wines – Sekt – and in 1992 a Sekt manufactory was completed to be able to produce the Sekts entirely at the premises. Germany is one of the largest sparkling wine markets in the world, which is not well known around the world. Germans drink a lot of sparkling wines, although in general less quality-conscious than the French. One out of four bottles of sparkling wine is consumed in Germany, roughly 500 million bottles. Sekt is made in all German wine regions, both in the méthode traditionnelle and charmat method. There are three groups of Sekt makers: (i) large and (ii) smaller Sekt houses, who only make Sekt and (iii) winemakers, who make predominantly wine, but complement their wine selection by a few Sekts. The Sekts produced by large Sekt estates tend to be in the demy-sweet and sweet range, while the Sekts of smaller estates and the wine makers, like Wein- und Sektgut Barth, are mostly in the brut and extra brut range. At Wein- und Sektgut Barth, all Sekts are bottle fermented in the méthod traditionelle starting with base wine production, subsequent bottling, bottle fermentation, hand-riddling, and disgorging. All Barth Sekts remain on the lease between 24 and 36 months. In 2010, Wein- und Sektgut Barth released the first ever German sparkler made from a grand cru base wine. The novelty was named Barth Primus, and put Barth on the map for the serious Sekt lover. Although the Barth Primus is an extremely successful sparkler, Wein- and Sektgut Barth has stopped to label this Sekt as Primus but instead put the vineyard name on the label. Accordingly, in the tasting with Mark Barth, the top sparkler we had was the 2011 Wein- und Sektgut Barth Hassel Riesling brut – an ultra-premium Sekt from the Hassel vineyard, a VDP.Grosse Lage vineyard. Today, Wein- and Sektgut Barth is recognized among Germany’s preeminent traditional method Sekt producers and they have had their products featured in Michelin star properties as well as with Lufthansa Airlines. Wein- und Sektgut Barth produces mostly Riesling (83%), followed by Pinot Noir (12%) and a few other varieties (Pinot Blanc, and Cabernet among others) on vineyards of clay, black loess, marl and slate soil, creating elegant and well-structured wines. Environmentally friendly viticulture is of utmost importance to the Barth family, who shows great care towards the vine, soil and nature. Time-consuming vineyard work like harvest reduction and the harvest itself are all selectively done by hand for optimum ripeness and flavor. The estate was certified organic by BioWein in 2013. The top sites comprise Wisselbrunnen, Schönhell and Hassel, all VDP.Grosse Lage and Schützenhaus, a VDP.Erste Lage. And of course, Wein- and Sektgut Barth also produce wines at the Ortswein level and at the Gutswein level. We had a traditional Rheingau "Schlachtplatte" for lunch and went through a series of Sekt and Wine tasting with Mark P. Barth. Thanks Norbert and Mark P. Barth! Founded in 1870 by Balthasar Ress in Hattenheim in the Rheingau, Weingut Balthasar Ress developed into one of the leading wine estates of the Rheingau region and became a global player in the wine trade. It is a member of the VDP, the association of about 200 German elite winemakers. 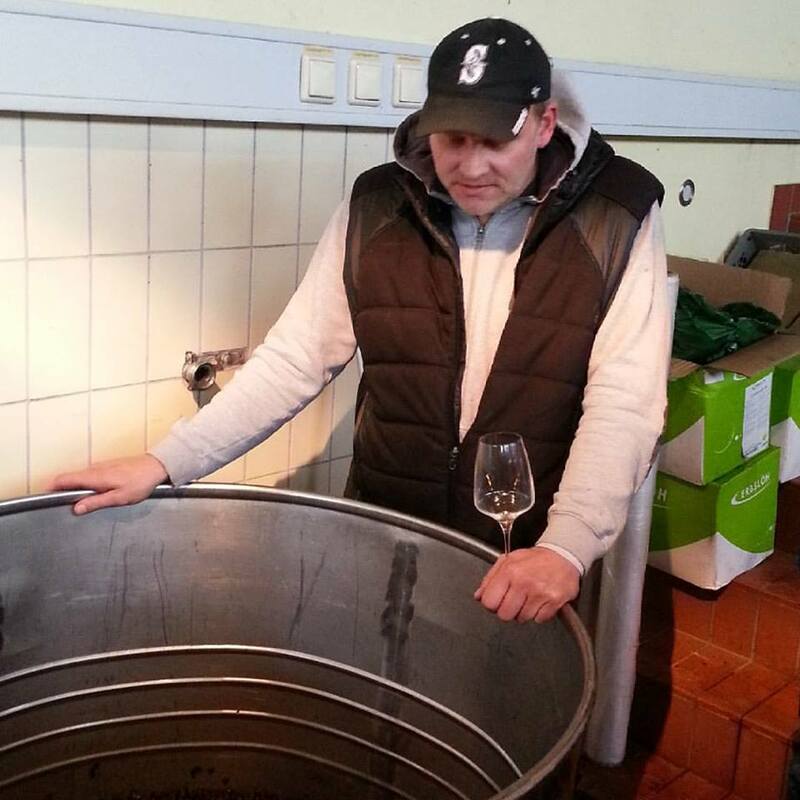 Stefan Ress – now senior boss - owned and run Weingut Balthasar Ress for many years. In 2010, his son Christian Ress took over and Dirk Würtz became Winemaker and then Technical Director. With 46 hectares under vine, it is also one of the larger estates in the Rheingau. Riesling accounts for 90 % of the grapes in the vineyards: Berg Roseneck, Berg Rottland and Berg Schlossberg (Rüdesheim), Engelmannsberg, Nussbrunnen and Schützenhaus (Hattenheim) as well as Höllenberg (Assmannshausen). Since June 2009, the winery owns by a 3,000 square meter vineyard ion the island of Sylt; it is the most northerly vineyard in Germany. With Christian Ress and Dirk Würtz having taken over, Weingut Balthasar Ress has launched a series of new initiatives. Dirk Würtz is the brain behind the initiates in terms of vine growing in the vineyard and wine making in the cellar. I joined Dirk Würtz during the 2015 harvest for an afternoon and had a chance to talk with him about a variety of issues, including his push towards organic/natural/biodynamic winemaking, his “orange” wine, his ultra-premium red wine, to name a view. Overall, it was an exciting afternoon with a fascinating winemaker, who is also a star in the social media wine scene in Germany. The Ress family is an old, established family in Hattenheim. For generations, they were butchers, and the butcher shop "Metzgerei Ress" exists to this day. In 1870, Balthasar Ress, who was a butcher himself, founded the inn "Gasthof Ress" on Hattenheim's main street, thereby laying the cornerstone of a long tradition in the hotel and restaurant business as well as the wine estate and wine business. Since then, Carl, Paul, Stefan and now Christian Ress have been at the helm of the Ress Empire. By the 1920s, a thriving wine business had developed. In 1947, Carl Ress founded "Balthasar Ress KG - Wine Estate Proprietor, Winery, Hotel Ress." After Paul Ress’ death in the early 1980s, the family's entire properties were redistributed. Stefan Ress' siblings received the properties in Rüdesheim; he remained the proprietor of Weingut Balthasar Ress. In 1999, Stefan's son Christian Ress entered the business as the fifth generation of the founding family. He became General Manager in 2010. Since then, he has continued to expand the wine estate, which today comprises 46 hectares. Christian Ress has achieved considerable attention in the wine trade for innovative projects, such as planting Germany's most northerly vineyard on the island of Sylt, near the border with Denmark, in 2009 and opening the wineBANK in Hattenheim in 2009. Balthasar Ress in Hattenheim has always had a strong reputation in the premium segment of German wine, but was not known to be an innovator, leader and trend-setter in German wine. This changed, when Dirk Würtz – wine maker, wine blogger and wine TV journalist – joined Weingut Balthasar Ress in 2009, first as winemaker and then as Technical Director. Together with owner Christian Ress and senior boss Stefan Ress, he is pushing Ress to new hights. 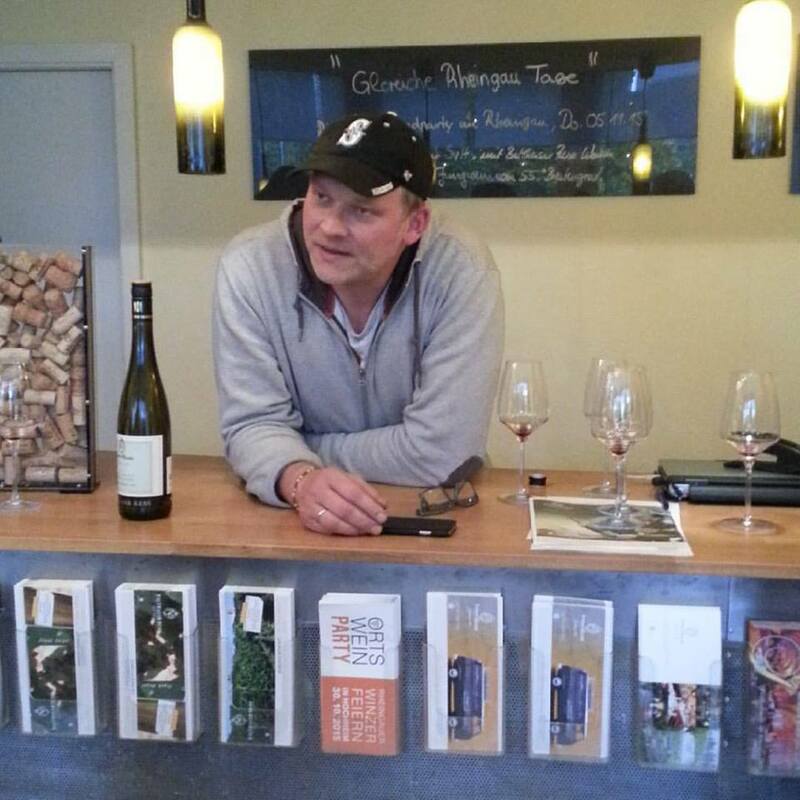 Dirk Würtz is a winemaker from the Rheinhessen region Germany. He started his career at Weingut Robert Weil, the famous Rheingau producer, to which he is still very attached. “What I am today I am thanks to Wilhelm Weil”, he says. Dirk Würtz is not only a successful winemaker, but also a leader in terms of social media in the German wine industry. Dirk is the most popular wine blogger in Germany. Until recently, he had his own internet TV show “100 Grad Öchsle”. This was a very professionally made one- hour talk show with prominent guests from the wine industry. And he was the front man of a video series on wine produced by the Stern, a leading German weekly. In 2016, Dirk will be back with a new show, he told me. Robert Parker: Balthasar Ress is one of the Rheingau estates that is mostly discussed in tastings and wine forums in Germany. Since Dirk Würtz took over the management of the vines and the winemaking he introduced a style of wine which prefers the uncompromisingly pure, dry and straightforwardness to one that is more charming and fruitier. However, the charismatic social media star Dirk Würtz was never striving for charming wines, neither as the right (or left) hand cellar master at Robert Weill in the late 1990s nor at his own estate in Gau-Odernheim/Rheinhessen. He prefers more this naked love-me-or-leave-me style (which is just a postmodern, viral form of modern wine marketing) and it's up to you if you follow his style (100% malolactic fermentation in 2013) or not. They surely enrich (and maybe also initiated) the new move in the Rheingau which had been the most less interesting German wine region for so many years. As far as the Ress (and many other new) wines are debated they are worth to be bottled and - at least - tasted. There is something going on in the Rheingau, Ress sei Dank! Not very well known in the world, Germany has become a serious red wine producer. Red wines now account for more than 1/3 of German wine production. Before turning to one of the best German Pinot Noirs currently on the market, let me quote what German Wine Guru Stuart Pigott, now based in New York City, has to say about the “German Red Wine Revolution”. Stuart Pigott: Sophisticated German red wine? Really? Internationally, there’s still a lot of resistance to the idea that red wines from Germany can be better than moderately good and even this would be an exception to the rule. Amongst experts and Somms around the world the standard view is still of Germany as the prototypic cool climate wine producing nation, that therefore the white wines will always work better than reds, and even these will tend to be light in body and high in acidity. Many of those experts and somms are convinced that German red wines are hopelessly over-oaked, if necessary in defiance of evidence to the contrary. The truth is that a combination of climate change and greatly increased ambition in red winemaking already began altering this significantly during the early 1990s. Although Riesling accounts for 90% of the Weingut Balthasar Ress portfolio, Weingut Balthasar Ress is part of the group of German winemakers that produces world class (and rather expensive) Pinot Noir wine. I had the chance to taste the 2015 Weingut Balthasar Ress Caviar de Pinot (while fermenting) and the 2013 Weingut Balthasar Ress Caviar de Pinot (from bottle). 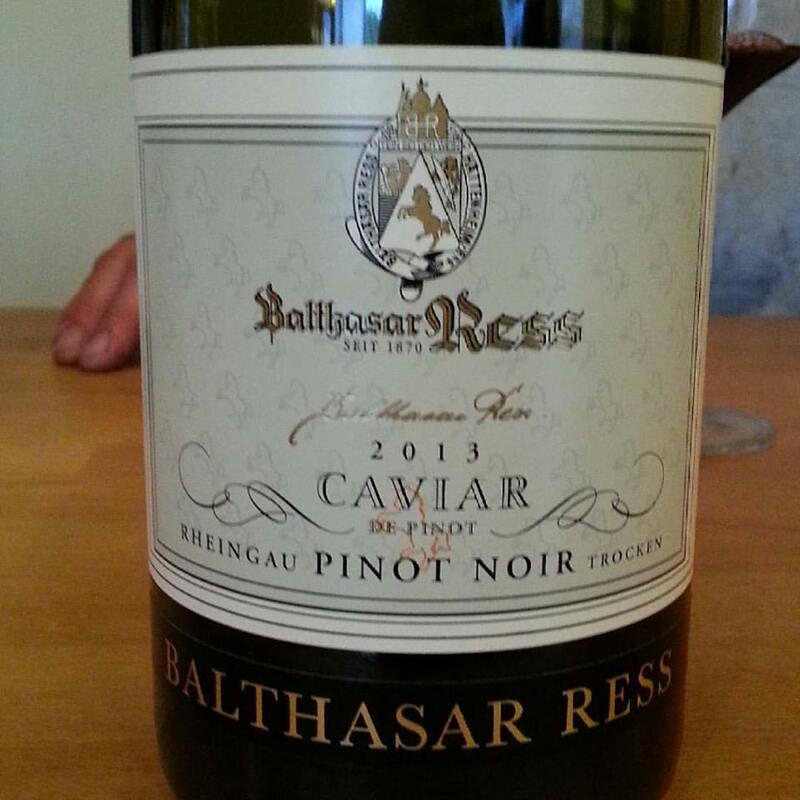 The 2013 Weingut Balthasar Ress Caviar de Pinot could easily pass as a Frenchman, as a Bourgogne. Rather dark for a German Pinot Noir, cinnamon, clove and brown spices on the nose, silky, dense and velvety mouthfee, a very special wine, will improve further over the next 5 to 10 years. I also had a chance to taste the 2015 Weingut Baltasar Ress Pinot Blanc Orange Wine (while fermenting). 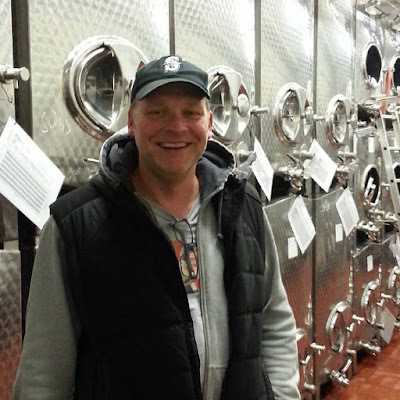 Dirk Würtz: "Orange Wine is nothing else than a white wine fermented like a red wine, i.e. the grapes are de-stemmed, everything else is macerated and fermented like this, how we do it with red wines - on the skins. That’s it.” The previous vintages of Dirk Würtz’s Orange Wine were praised widely. Under the leadership of Dirk Würtz, Weingut Baltasar Ress is moving to organic/biodynamic winemaking, more generally: towards wine making with an ecological mindset. As part of this process, Weingut Balthasar Ress is working in one part of the Engelmannsberg in the conventional way and in the other part moving towards organic/biodynamic vine growing. As a result, there are 2 wines, from the same vineyard, same grape variety (Riesling), one from the organic/biodynamic parcel and the other from the other parcel (conventional). This is a most interesting experiment. The two wines (2013) are available only through K&U Markthalle in Nürnberg for Euro 23, both wines. Tasting these two wines side by side, the differences are striking. The biodynamic version appears more mature. You can imagine that the grapes looked different at harvest compared with the conventional version, probably smaller with less juice. They had to struggle more to grow and develop. This translates into a denser wine in the glass. The mouthfeel is smoother, thicker, and creamier, with a hint of sweetness. Turning to the conventional version, on the nose, you get green apple and some pepper notes, in the mouth, the wine is leaner, sharper than the biodynamic version. You can imagine that the conventionally grown grapes were greener with more juice, when they were harvested. In terms of key numbers - like acidity, remaining sugar, etc. - the two wines are pretty much the same. Both wines are very dry, with 3 g/l emaining sugar and 6,5 g/l acidity. Looking at the bottles, the only difference on the label is the AP (Amtliche Prüfnummer): AP 31 059 011 14 (biodynamic) and AP 31 059 009 14 (conventional). Weingut Balthasar Ress produces a series of Grosses Gewächs GG wines, Germany’s new category for ultra-premium dry wines. A GG is a ultra-premium dry wine from a Grosse Lage (Grand Cru). Here is what Robert Parker (Stephan Reinhardt) had to say about the 2013 Rüdesheim Berg Schlossberg Riesling trocken GG. Parker: 92-94 Points - The citrus colored 2013 Rudesheim Berg Schlossberg Riesling trocken GG shows an impressively deep, pure, dense and complex bouquet of crushed rocks, quartz, limes, citrus oil, orange peel and white peaches but also some irritating malo flavors (cream, Sauerkraut). Full-bodied, this is a pure and salty Riesling showing complexity and a persistent salinity. It combines power with purity and elegance with a frisky minerality which makes this a stimulating, well balanced wine to one of the finest dry Rheingau Rieslings of the vintage. The GGs are the top dry wines. At Weingut Balthasar, there is a dry white wine above that category, Balthasar Ress’s Resspekt. The grapes come from the best parcels of the Rüdesheimer Berg, i.e. from different vineyards. After a long maceration, the wine fermented spontaneously. Following a long period on the lees, the wine is bottled unfined and unfiltered. Here is what Robert Parker (Stephan Reinhardt) had to say about the 2013 Resspekt (95 Parker points): The 2013 Riesling trocken Resspekt (a wordplay with the name Ress and the word respect) is the only wine under cork from this estate. Unfortunately the cork is sealed with a thick wax closure which is extremely difficult and time-consuming to remove. As soon as this is done you discover a golden-colored Riesling of great intensity, depth and purity on the nose. This is an enormously rich, concentrated, piquant and tension-filled yet also an elegant and well balanced Riesling of great length with dried fruit aromas in the long aftertaste. Bone dry and full-bodied, this great and particular Riesling is characterized by its botrytisized and ultra-ripe fruit flavors. Although it's not my style of Riesling I would be happy to have a glass of it at least every single year. Let me finish with a wine that I did not taste during my visit at Weingut Baltasar Ress, but which I know very well. It is my house wine in the US. Available at Total Beverages, just around the corner where I live in the US: Dry, crisp, fresh entry-level wine with citrus, lemon zest and mineral notes. Reasonably priced.